Simple things done well. That is what I want in this season of spring produce. The sweetest strawberries, perfectly roasted asparagus, and fresh artichokes with leaves tightly snuggled together. All they needed was a simple steam with herbs and lemon and a delicately flavored aioli to drag the tender heart through after all the leaves have piled up, teeth marks down the center. I get caught up in the effort of being different with cooking and forget that it's the simple things that usually bring the most attention to good quality ingredients. 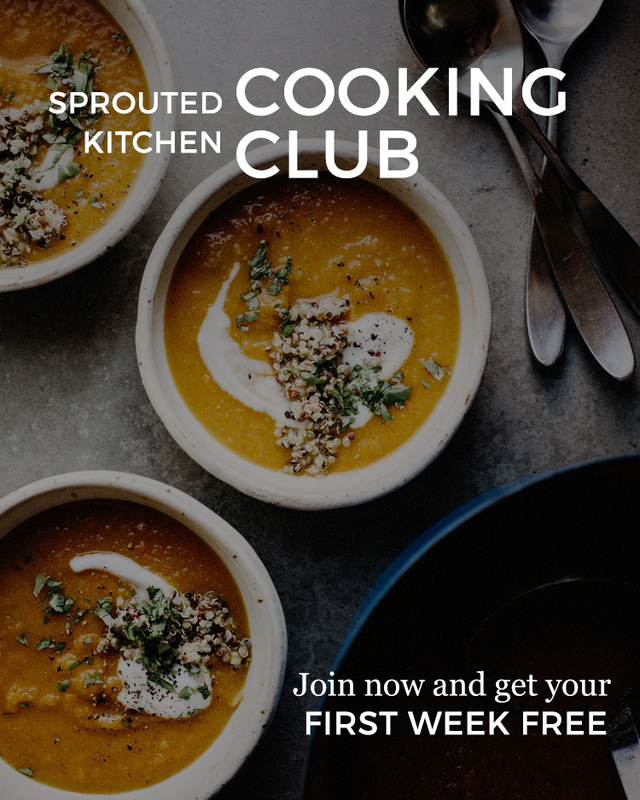 I enjoy pouring over food magazines, reading some recipes that I may not ever make just because I am curious about technique and want to learn. I have a binder full of pages I've ripped out of recipes I want to try, very few which I've actually gotten to. I kept a page from the recent Bon Appetit with a header claiming "The Creamiest Aioli by Suzanne Goin" and along with the photo "World's Greatest Mayo." We can agree those are pretty bold claims alongside the name of a well-know and talented chef, so while I don't consider myself a frequent aioli maker, I needed to know if this bold, black type face was really the truth. In short, I loved it. It would really be delicious on a number of vegetables. I hesitate to validate the claim that it's the "best," as I've made aioli about three times, but it's pretty darn good. I may have strayed slightly from the recipe, but that's to be expected - it's a keeper. The original recipe suggests 1/4 c grapeseed oil and 1/4 c olive oil. While I am sure that makes for a more mild taste, I didn't have grapeseed, and found my adjustment below to be just fine. My addition of a spicy dijon and heavy hand with the citrus trumped any chance the olive oil had in taking over the flavor. Suzanne suggests to serve this on some poached salmon and that sounds incredible, maybe topped with a bunch of green herbs. I've had one bad go at homemade aioli and learned it's important to use a fresh, good quality egg. Anything less just doesn't get quite as creamy. If your mixture is greasy instead of fluffy, it is called "breaking." 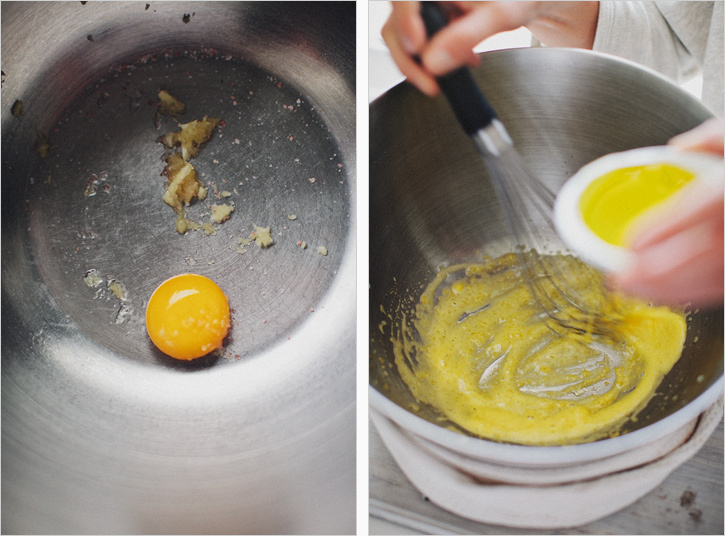 To fix it, start with a clean bowl, a new yolk and slowly drizzle in the broken aioli to the new bowl. Settle a large mixing bowl in the nest of a damp dishtowel to steady the bowl. Whisk the egg yolk, garlic, salt and 2 tsp. water in a metal bowl to blend well. It will start to get a bit foamy. Whisking constantly, slowly drizzle in the oil, about a teaspoon at a time, until the sauce is thickened and emulsified. Whisk in the cayenne, lemon juice, dijon, and few pinches of pepper. Taste and alter as you prefer. Cover and keep the aioli in the fridge. Prepare the artichokes. Cut off most of the stem and prune away the bottom leaves. I like to snip the pokey edges off the leaves and chop off the upper quarter of the artichoke, this is optional. I like how it looks but it's by no means crucial. In a large pot, bring the broth to a gentle simmer. Squeeze in the lemon and toss it in the broth. Add a few generous pinches of some dried herbs, basil, herbs de provence, thyme etc. If I have white wine open, I'll put a splash in the broth as well. 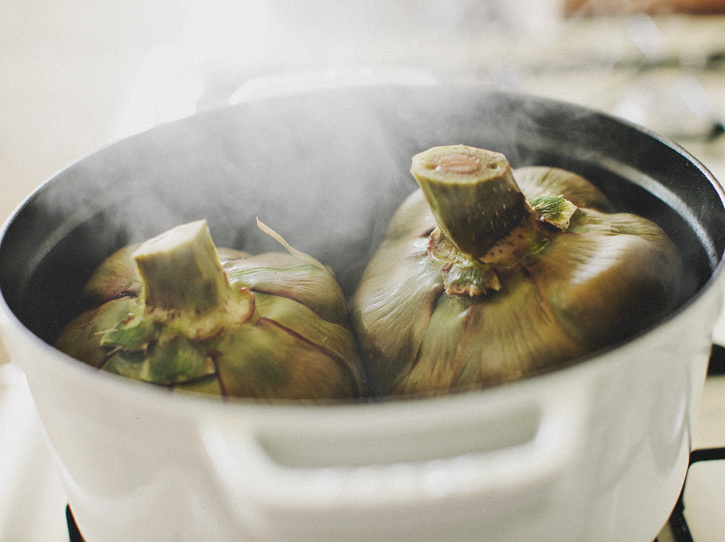 Put the artichokes in, stem up, cover and simmer for about 30 minutes or until a leaf easily pulls away from the stem. Time will vary by size of the artichoke. Serve warm with the aioli on the side.